The July 21 Cut the Rope update adds Toy Box and secret drawings. Each Om Nom drawing looks like a paper corner that you can turn (see red arrow). 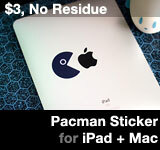 Thankfully, you don’t have to hit the collectable Om Nom drawings with candy or avians (Angry Birds golden egg style) to pick them up. If you see a secret unlockable Om Nom drawing, you can tap it to collect it. Want to know cut the rope drawing locations? Read below for a tip to find the first (and other) Om Nom drawing. 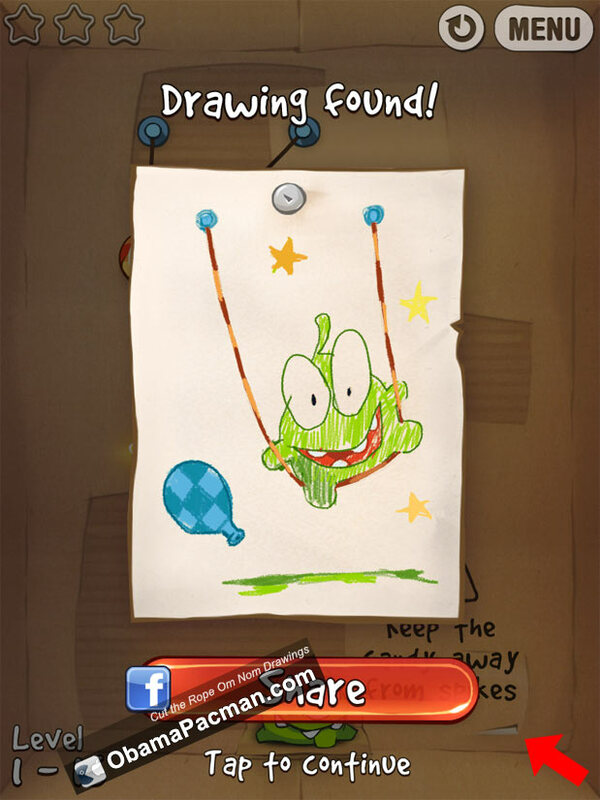 Where Are the Drawings in Cut the Rope? That’s level 1-16. Good luck hunting. If you found others, share the locations in the comments below! There are no secret drawing about the DIY Valentine’s “Cut the Rope” removable bikini at this time. This entry was posted on Saturday, July 23rd, 2011 at 8:05 pm	and is filed under iPad Apps, iPhone Apps. You can follow any responses to this entry through the RSS 2.0 feed. I think that’s “no broccoli”. Candy only! U said “7-3 (this was the hardest for me , it’s right under the hat closest to the top of the device .)”. U know that all u need to do to take a drawing is to ,,cut” it?! @katie i think it’s in the top righthand corner ? lol i forgot ! Thanks! Totally got them all now! Thank you for your help kevin!I appreciate it and i have found them all. I don’t know how you did it but your amazing! I Just had one left, and was the 7-3, yes, very hidden. Thanks a lot! Where is the top right hand corner drawing? I have all of them except that one and I have looked in all the levels posted above and liked on facebook. Help me! Thanks. I could not find it (7.3). Finally I found your help and then all cute drawings were mine! Has anyone found the last drawing yet?? If you follow the guide above u will have it..
EDIT: see nyeh’s comment below. Cool. It’s nice that they make the “like” optional. Thanks dude, 7-3 was driving me absolutely crazy trying to find!!! What’s the level for the drawing on the far left? I swear I’ve gone through the full list twice. i already got them all , but i’m PRETTY sure it’s 7-21 ! try for it there ! and if not it may be 5-1 or 5-15 ! I can’t find the 5 15 one i checked everywhere!!! I can’t find the one on the far left bottom?? how to get final drawings??? What’s the one on the right of the facebook drawing? Can’t seem to find him. U know you dont need to like their page on facebook, just press the link, go out of safari and go back in the cut the rope app. i see twelve , and sorry about the duplicates ! Like their page on facebook – In Game. how do you know, which is missing. I have 13/14. It is the 6 th pic, the first in the 2 nd row missing….. Can not find, & don’t really know where to look. Zplasse, if you got the latest version, try one of the new levels 7 to 10 (look in the article for the revised level order). If you just tap on the picture that says like on facebook and then tap like you it will take you to the safari and you can just exit out. I worship you Kevin, the all mighty sea cucumber! hahahaha you are far to kind ! what happens when you get all of them? What level has the drawing for the far right middle space. Kevin help or someone!! I have found all but the one on the bottom right. Please help! I cant find 7-3. Can someone help me…. Where can I find the drawing above the Facebook Button ? the Picture between Tree and the three black figures ? Ummmm what happens if you get them all??????!!?!? Which level is the drawing right underneath the FB picture? The center one in the bottom out of all the painting, which is between the om nom eating a carrot and a tree with candies in it. It is also under the picture of the om nom in space. PLEASE HELP ME! Look in 5-1 or 5-15 if its not in 5-1, go to 5-15 and get the candy to the right side of the screen. Where is the Facebook picture? Driving me crazy! @Abby It’s already mentioned on top. Click facebook within game to get. Thanks so much for the article and thanks Kevin – great stuff! I liked via Facebook then I went through the whole list and found them all (I think) but I’m still missing two pictures?!! It makes no sense. So I’ve repeated the list several times and still no luck. Can anyone describe which levels I could find the top right drawing (to the right of the spiders) and the middle far right but one (underneath the spiders) please? Thanks! Thanks Kevin that helped a lot!!! The one that says ‘like on Facebook’: is that a pic you have to get also? okay… can’t find the far left drawing or the bottom right (3rd row) … where are they? I tried replaying all the levels… got 3 stars and still did not get drawings. Neither could I. I searched loads of times. I am addicted to this game but I can’t find the drawing in the top right corner above the one where omnon is sitting on the candy! Please help! It’s driving me nuts! I found 9-21. I might be too late too post this. And for everyone else, new BUZZ BOX for CTR is available now. Ok folks, with today’s update the boxes were moved around. Will update it soon when I get the list of old boxes. Updated with new level orders. last picture as of now is 10-15 buzz box. Where is the drawing 2nd to the left on the bottom? Bottom row counting from the left, second image is from level 1-16. Top left is currently 4/21. Cheers. Great! Glad to hear it Mamaof2. I have the Cut the rope v1.6 so I got all of the pics except Level 7-3, so I think that the Boxes has changed numbers, I guess after this update (1.6)the boxes number has changed especially the boxes starting from box 3. SO I NEED HELP! All the v1.6 locations are listed above in the main article, as well as the locations for the older 1.4 and 1.5 versions. Hi Soto, what box / level? It’s level Magic box #3 (that’s a hard one to find as noted above). Don’t forget to follow us on Twitter or like us on Facebook. I still have two missing, I have the iPad version. What are the locations of the blank spots of your missing drawings? Can’t find the drawing on the far left, middle row….under the spaceship beaming up the candy. Should be Tool Box 21.